Today is Kenneth Bulmer's birthday -- he'd have been 98. I've posted a lot of reviews of Bulmer's Ace Doubles already, but there always seem to be more! This is actually a review I wrote a while ago, but it's been off the internet for some time, so here it is again. As I've previously mentioned, one of my goals is to cover at least one entry by all of the most prolific Ace Double contributors in this series of reviews. This book pairs two quite prolific Ace Double writers: Bulmer wrote 15 Ace Double halves, Reynolds 13. I'd already reviewed a Bulmer book, but this is my first Reynolds Ace Double. Planetary Agent X is about 47,000 words, Behold the Stars about 44,000. This Ace Double also represents one of those in which the halves seem mildly thematically linked: both of these rather explicitly concern human expansion and colonization of the stars. Mack Reynolds had a well-established reputation as sort of John W. Campbell's pet socialist. Reynolds (real name Dallas McCord Reynolds) was in fact an active member of the American Socialist Labor Party, and his father Verne Reynolds actually ran for President twice as a representative of that party. I've read only a couple of his books, and they do not seem overtly Socialist to me, though they aren't anti-Socialist either. (I understand that a few of his novels were more explicitly Socialist.) It seems to me that politics aside, he resembled Campbell quite strongly in being contrarian in temperament, and in promoting some of Campbell's tics regarding individualism and secret organizations working for the good of man and such like. The novel is a straightforward fixup of two novellas about Ronnie Bronston. Bronston lives some centuries in the future. Humans have colonized hundreds of worlds, many, perhaps most, united by a very loose government, centered on Earth, called United Planets. The central tenet of the United Planets is that interference with the internal affairs, particularly the political organization, of member planets is verboten. Ronnie dreams of going offplanet, and the only route to that is to work for UP. As the book opens, he is interviewed and hired for a casual-seeming organization called Section G. This seems to be sort of a secret department, aimed at enforcing the noninterference rule. Ronnie's first assignment is to track down a criminal named Tommy Paine, who has been fomenting revolutions on numerous planets. His revolutions follow no specific pattern -- mainly simply removing entrenched autocrats from power, or forcing static societies out of ruts. He is assigned a beautiful Eurasian assistant, Tog Lee Chang Chou, who proceeds to annoy him en route to the various planets he suspects Paine might be at by playing Devil's Advocate. For all Ronnie suggests that some of these societies might deserve interference, Tog has reasons (not necessarily consistent) that they should not be messed with. The ending to this section is easily guessed, and very predictable, involving among other things the meaning of Tog's name. At any rate, Ronnie is promoted to full membership in Section G. His next assignment, in Part II, is to track down Billy Antrim, a very young "pistolero" from a Mafia-dominated planet. (It is not, I am sure, a coincidence that "Billy Antrim" was one of the names Billy the Kid went by.) Billy was sent by his mob boss to kill a squealer who had come to Earth. The story actually focuses more on Billy's fleeing than on Ronnie's chasing, though the end, which is a bit dark and somewhat effective, does deal with Ronnie. I assume there are a few more United Planets stories in Reynolds's bibliography. [Indeed there are -- quite a few, though this was the first.] For myself, this was not bad, though far from great. Enjoyable if predictable. I've previously mentioned Kenneth Bulmer's career. 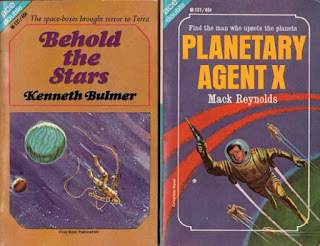 He was a very prolific English SF writer, publishing something like 100 novels, including the Dray Prescot series (as by "Alan Burt Akers") for DAW. He also edited the last several volumes of the classic English original anthology series New Writings in SF. Behold the Stars concerns David Ward, ex-Army, who is working for the Solterra government matter transmitter operation, several years after the end of a wearing war with the alien but nearly human "Venies". Space travel is mostly done by matter transmitter, but STL spaceships need first to travel to distant stars to place receiver stations (though the ships can be fueled by matter transmission). Some of the Solterra spaceships are encountering a new alien race, which has ambushed several human installations. War seems imminent, but surprisingly many top people are very pacifist, despite the aggressiveness and provocation of these new aliens. Ward himself, though no pacifist, is reluctant to fight again -- he feels he did his time in the previous war. But his best friend disappears, and his friend's girlfriend introduces David to a beautiful girl who, it turns out, wants David to investigate the other guy's disappearance. All this leads to David confronting his "cowardice", falling in love with the new girl, and tracking down his best friend -- which also leads to a solution to the problem of the pacifists. It's not very well worked out. The deck is stacked to favor certain arguments. Some of the action is silly. The end is terribly abrupt. Even so, I enjoyed the characters (though they were terribly two-dimensional), and the story was a breezy read. I can't rate it as very good, but it was at least passable, if you swallow some of the absurdities.